Using Cass Gilbert’s work around the turn of the 20th Century as a vehicle for exploration, this paper discusses the conflict that exists between the planning ideals of the City Beautiful Movement, as embodied in the Report of the New Haven Civic Improvement Commission, and the design of skyscrapers by Beaux-Arts architects. As a nationally renowned architect, Gilbert embodies the work of other Beaux-Arts architects of the era and is therefore able to serve as a case study in the matter. Gilbert’s own conflicts and contradictions speak to a more general dilemma that many City Beautiful planners faced when commissioned to design skyscrapers. Ultimately, Cass Gilbert is able to reconcile this dilemma as seen in his design for one of the most important American buildings of the 20th Century. By 1910, when the Report of the New Haven Civic Improvement Commission – a landmark City Beautiful plan for the Connecticut city produced by nationally renowned architect Cass Gilbert and landscape designer Frederick Law Olmsted Jr. – was published, the impact of 50 years of rapid industrial and commercial development was perceived as both an opportunity and a problem in need of reform. The great centering of industrial wealth that had occurred in cities across the country since the end of the Civil War provided the financial opportunity for public improvement projects while the associated commercial development of this period simultaneously created the conditions that required a response. 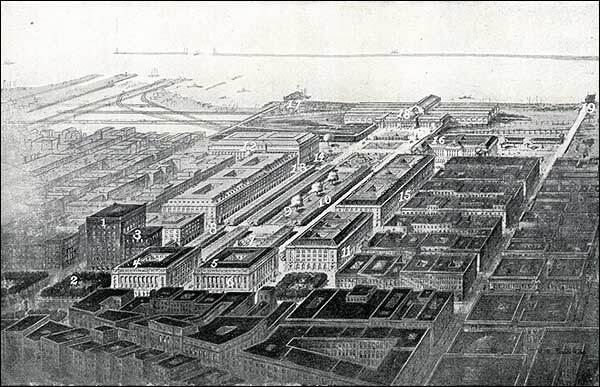 However, the reforms offered in response by the City Beautiful Movement contained several conflicts, some of which prevented many plans from being implemented and some of which highlight the contrast between Beaux Arts architects’ theories on urban design and much of their actual built work. The factors that inhibited the implementation of City Beautiful Plans include public opposition or disinterest, and a lack of government willingness and ability to support and enact the plans. As Geoffrey Blodgett, a former Robert S. Danforth Professor of History at Oberlin College whose dissertation focused on political reform efforts of the late 19th Century, explains “between the Civil War and the New Deal, the administration in Washington was Republican 75 percent of the time, with comparably lopsided statistics for control of the Congress and of the state governments outside the South. The Republican party [at this time] was the party of […] government-sponsored economic growth.” In New Haven the same year that the Gilbert and Olmsted Report was published, republican Mayor Frank Rice assumed office. According to Doug Rae, current Ely Professor of Management and Political Science at Yale University, Rice’s mayoralty was based on “the promise that his city hall would be a business-oriented regime, with modest goals and an organizational focus that nobody could mistake for populism.” Public opposition of City Beautiful plans, which called for highly ornamented and monumental government buildings, was rooted in public skepticism of government. This skepticism was based on the competing interests of a working class general public and increasingly wealthy private business. While the City Beautiful Movement was interested in addressing government corruption through reform efforts, the lavish Beaux Arts designs of many government buildings did not necessarily communicate those efforts to the public. In addition to lacking public “confidence” and financial support from City Hall, the City Beautiful Movement’s plans often called for large public improvement projects that were out of reach for many municipal government’s coffers. 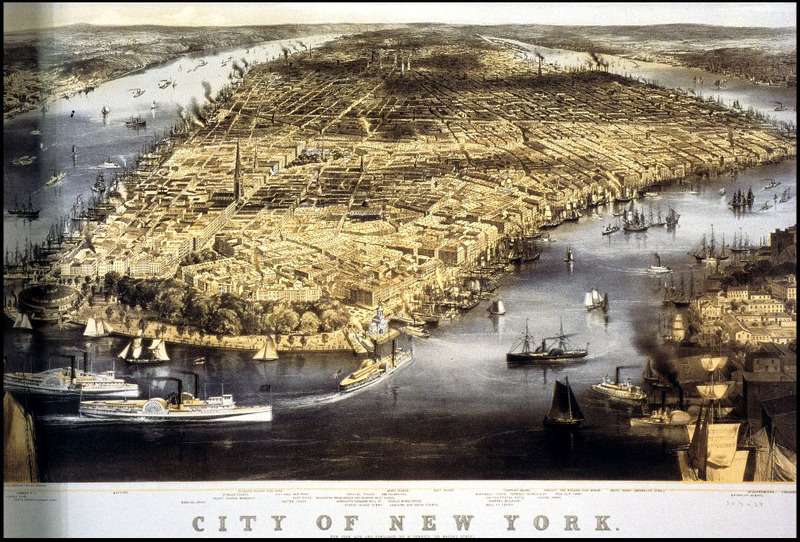 These projects included “reworking the railroad infrastructure, giving city government control of the harbor […] limiting building heights […] widening major street rights-of-way [and] eliminating rear tenement housing” – all requests that required government acquisition or regulation of private property, power which didn’t exist and wasn’t desired for municipal governments in the early 20th Century. 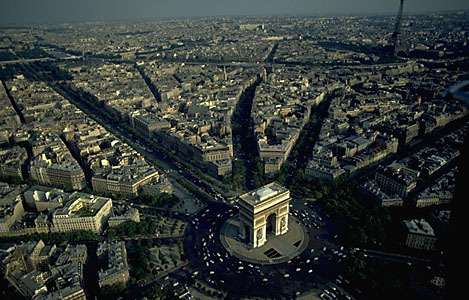 For instance, the type of political conditions that allowed Baron Haussmann to radically alter the City of Paris in the mid 19th Century under Napoleon III and achieve the urban form that the City Beautiful Movement sought to also achieve did not exist in the United States. Other conflicts include ones that highlight the contrast between proposals for uniform private urban building fabric absent of commercial skyscrapers in City Beautiful documents and the phenomenon of Beaux Arts architects designing tall buildings in the same cities for which the City Beautiful plans were produced. Cass Gilbert, who was both a Beaux Arts architect that worked on several planning documents and designed tall buildings, will serve as the primary vehicle for exploring these contradictions and ultimately determining how they were reconciled. As one of the greatest American architects of the 20th Century, Cass Gilbert received many important commissions, which continue to be exemplars of quality design and civic spirit today. Gilbert’s life and early professional career began in the Midwestern United States. 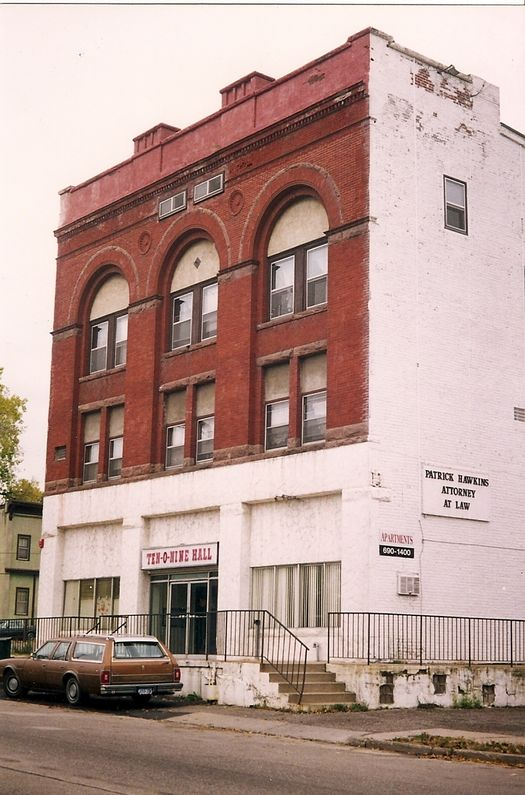 Some of his early works, like the Clark Bryant Block built from 1886-87 in St. Paul, Minnesota (Fig. 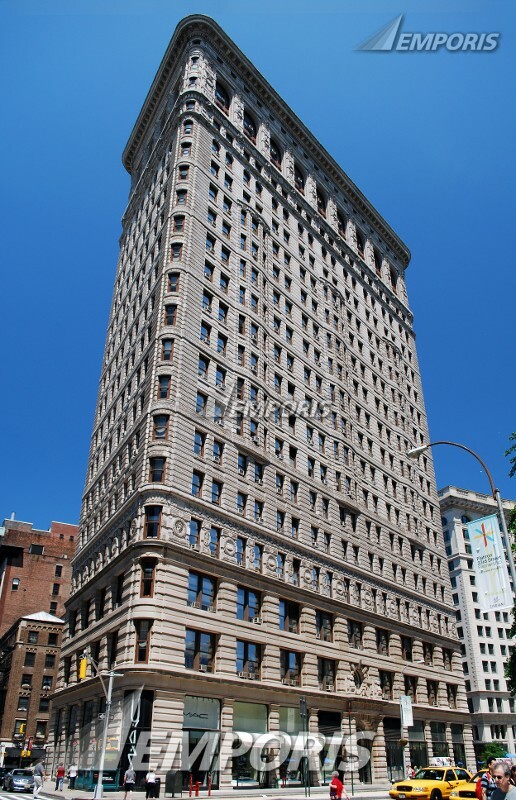 1), were typical commercial structures of modest size and materials, and simple proportions. However, by 1896 Gilbert received his “first important East Coast project”, Boston’s Brazer Building (Fig. 2), which he designed from his St. Paul office. 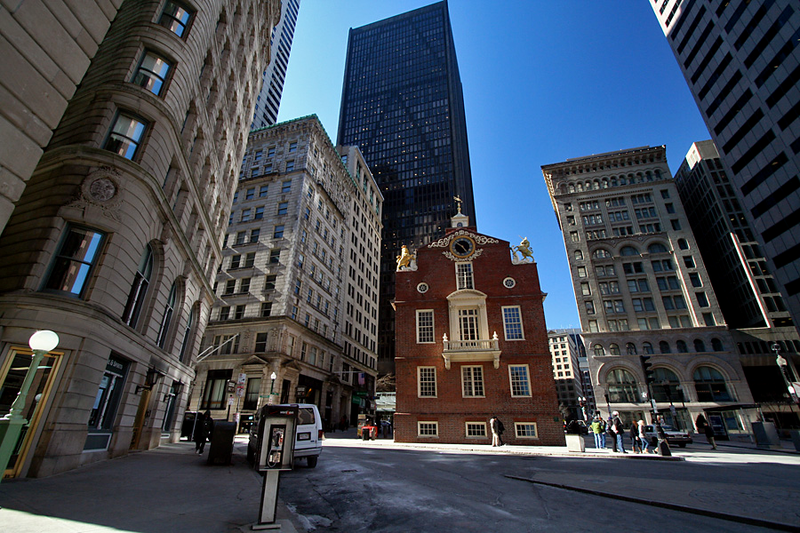 The 11-story commercial office building is located at 25-29 State Street – adjacent to the Old State House – in the heart of Boston’s old colonial center. Gilbert’s high-rise design was “the tallest building he [had] designed [and] was one of the earliest steel-framed buildings in Boston”. 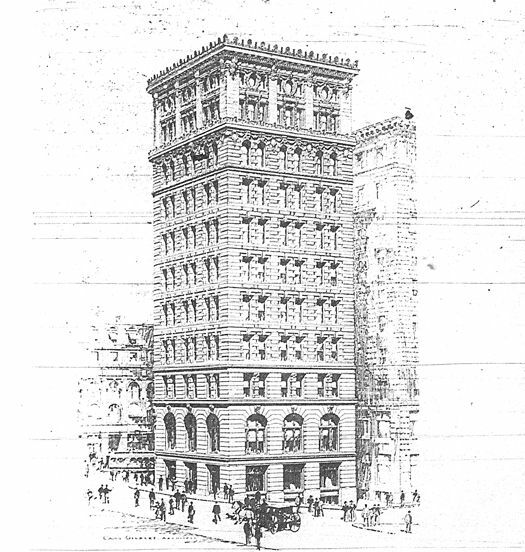 “During the planning for the Brazer Building,” the Cass Gilbert Society’s description of the building states, “there was a concern that the City of Boston was preparing to limit the allowable height of buildings”, which, if it had passed, would have affected Gilbert’s design significantly since “the small site [meant] Gilbert did not have the luxury to do much more with his design than maximize the square footage on each floor”. The Broadway Chambers Building (Fig. 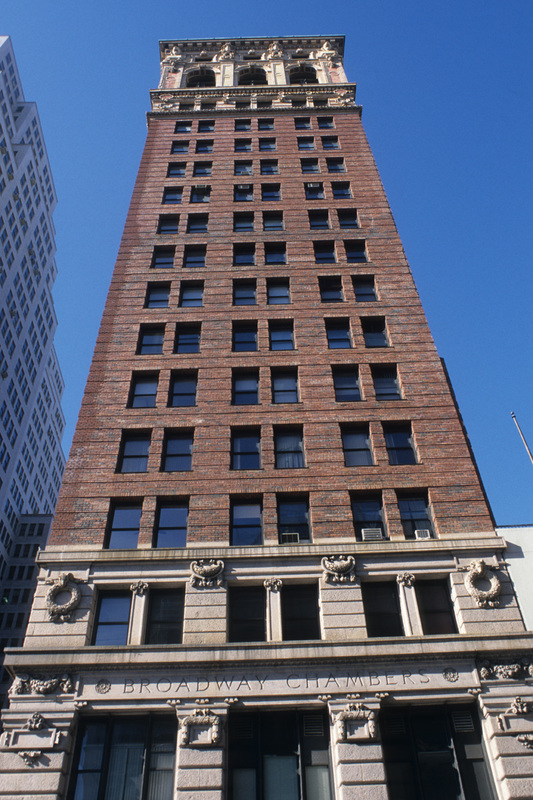 3) located at 277 Broadway in New York City was completed in 1900 and was, like the Brazer Building, designed from Gilbert’s St. Paul office. Also like the Boston project, there were new zoning laws being proposed for the City of New York at the time of the Broadway Chambers commission, which would have limited building heights on new construction. However, the original design was eventually built as the zoning laws did not pass. The 18-story building is “derived from Classical architecture [and exemplifies] the arrangement of the column – base, shaft, and capital”. The building’s granite, red brick and terracotta façade fronts City Hall Park – New York’s historic center and civic square. Between 1910 and 1913, Gilbert would receive numerous commissions, several of which were for tall buildings throughout the country. Completed in 1911, the Spalding Building (Fig. 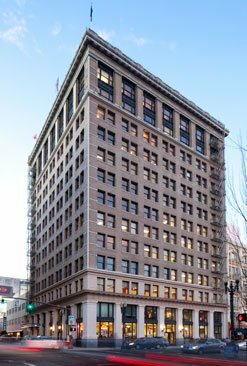 4) is a 103,824 square foot, 12-story office building located in Portland, Oregon, which was a growing industrial city of about 207,000 residents in 1910. 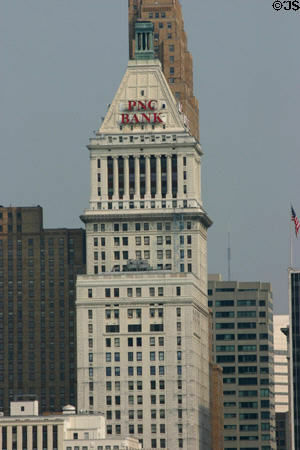 Newark, New Jersey, another growing industrial city with a population of 350,000 in 1910, saw the completion of the First National State Bank Building (Fig. 5), a 12-story commercial high-rise with ground floor bank, in 1912. 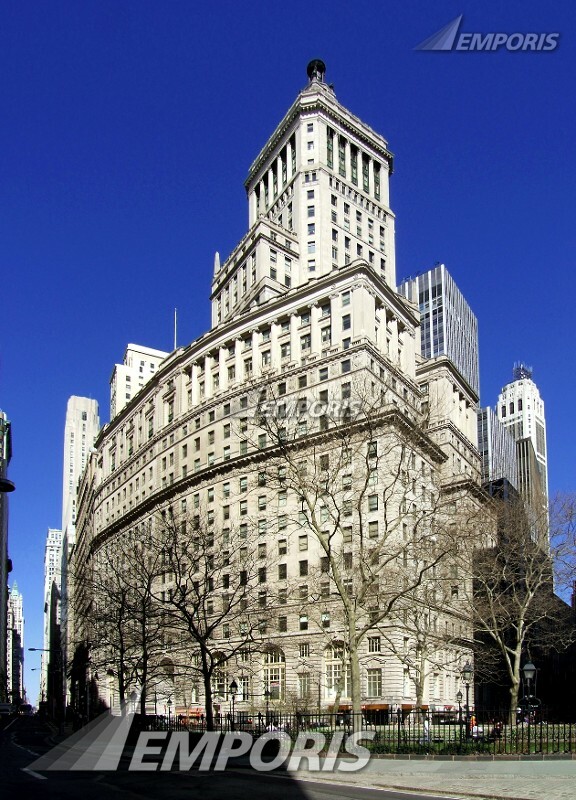 From 1910-1913 Gilbert worked on what is perhaps his most famous work, the Woolworth Building (Fig. 6), which is a 60-story Gothic style skyscraper located next to the Broadway Chambers Building and also facing New York’s City Hall Park. Union Central Life Insurance Co. Building (Fig. 7) is a “495-foot tall [building that] is one of the major skyscrapers designed by Gilbert” and it contains, according to Barbara Christen, a distinguished architectural historian, “powerful symbolic architectural language that conveyed the strength and stability of the insurance industry in the early twentieth century” in the growing industrial powerhouse of Cincinnati, Ohio, which boasted a population of 360,000 in 1910. Figure 7. Contemporary view of the Union Central Life Insurance Co. Building (Jim Steinhart) Fig. 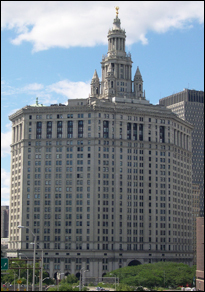 The four buildings described above, which were all completed within 3 years of each other, represent the rise of Cass Gilbert’s career as a prominent 20th Century architect and all of the examples above display his abilities as a tall building designer. However, individual building commissions were only part of his career. Barbara Christen, when reflecting on his career, states that “Cass Gilbert was a planner as much as he was an architect [and] himself thought his talents and contributions as a planner equaled those as an architect.” Gilbert was also an advocate for cities and their reformation, as can be seen on his work in Washington, D.C., his campus designs for the University of Minnesota and University of Texas, and the city plan for New Haven. 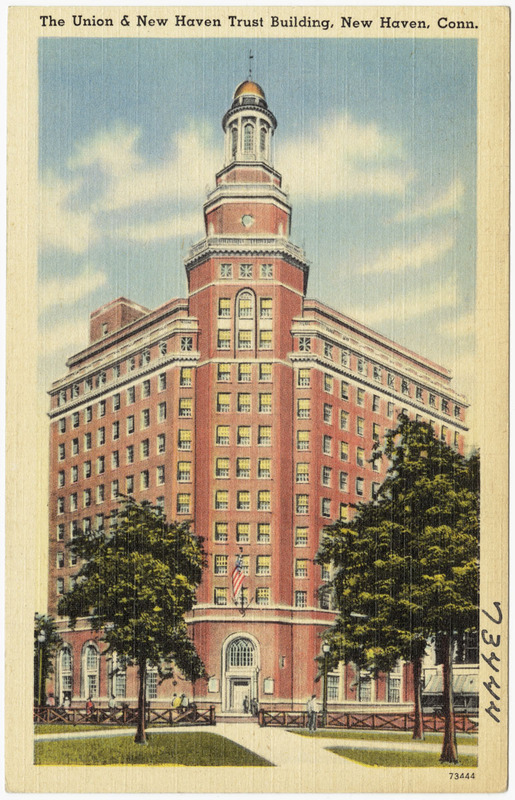 By the time Gilbert was commissioned to work on the Report of the New Haven Civic Improvement Commission in 1907, he had already completed several tall buildings including Boston’s Brazer building and New York’s Broadway Chambers building. The report also overlapped with several other tall building designs like the Woolworth building on City Hall Park and the Spalding building in downtown Portland. This was a pivotal point in Gilbert’s career where he was rising to prominence, receiving important commissions and refining his skills. The contents of the New Haven Report, which showcase Gilbert’s planning theories, present a stark contrast with many of his commissioned works of the same time period. The diverging ideologies apparent in the conflicts between Gilbert’s planning and individual building designs highlight the Beaux Arts architect’s dilemma in the early 20th Century. Of the “Present Conditions and Tendencies”, “Kinds of Improvements Needed”, and 93 “Specific Recommendations and Suggestions” outlined in the Report, six of these illustrate the modern Beaux Arts architect’s dilemma well. They are the Report’s population projections, colonial character preservation initiative, call for the establishment of a formal civic center, traffic decongestion recommendation, outline for shaping a cohesive, efficient and beautiful urban fabric, and encouragement of public ownership of facilities and utilities. The error, easy to spot with the advantage of hindsight, is that the authors carried their extrapolation across a great historical divide. They were living near the end of a great centering era, and reasoned as if capitalist development would, somehow, continue to promote change in unchanging ways – drawing people and investment inexorably into now-aging city centers. What they overlooked was the coincidental and temporary phase of technological development, which explained a period of rapid centering development in the same years – hardly a repeatable or cyclic event – appears to have altogether escaped attention in setting assumptions about growth in the 1910 study. The citizens of New Haven are familiar with the fact that the city is growing rather rapidly and that it is changing character as it grows; but many of them fail to realize how rapid and how profound these changes are likely to be in the near future. [New Haven] has […] been growing at a steadily increasing rate [and] many of those now living will see the completion of the process by which it is being transformed from the pleasant little New England college town of the middle nineteenth century […] into a widespread urban metropolis of the twentieth century… [Just] as surely as the earlier stages of this development force the installation of a joint water supply, a joint sewer system and a constantly increasing outlay for improving the streets upon which the urban travel is concentrated, so surely also will the conditions of a dense and widespread population force the joint provision of other facilities which the experience of large cities has proven to be necessary for the well-being of their people. For these reasons it is important not only to consider what is needed for the proper performance of the functions now imposed upon the streets and parks and the whole physical equipment of the municipality, but also in great measure to forecast the inevitable demands of the future greater city. In order to estimate what the future character of the city will probably be, it is needful to consider its past and compare it with cities that have gone through a similar history and already reached their greater development. Therefore, one can conclude that the types of development that are appropriate in those cities that have reached their greater development should also be appropriate in a city that is inevitably on its way to becoming a large metropolis. Preserving the Colonial proportions and history of the New Haven Green, which Gilbert felt was threatened, were primary concerns of his when crafting suggestions for the Report. With an interest in Colonial architecture and history” and in preferring “the formal languages of the past”, Gilbert “sought to utilize the historic core of the community for maximum effect while also respecting the traditions of past projects and ideas.” Gilbert did so by designing his buildings for the New Haven Green (Figs. 9 & 10) to be “Georgian in style and designed to be in harmony with the United Church, as well as other buildings in the historic core of the city”. For instance, his design of the New Haven Public Library (Fig. 11) sought to “make ‘the building distinctive and monumental and at the same time to preserve the proportions and spirit’ of the colonial architecture of New Haven.” Gilbert’s interest in New Haven’s character, in particular, and colonial architecture, in general, are again displayed in his later design for the New Haven Railroad Station (Fig. 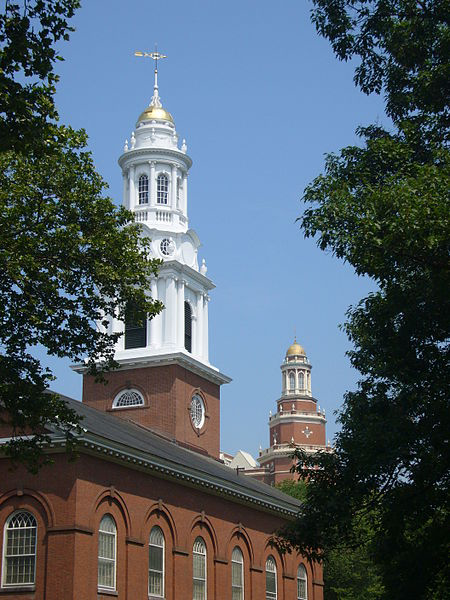 12), which, according to noted architectural historian Elizabeth Mills Brown, “shows Gilbert’s effort to create a specifically New Haven idiom, mixing Colonial motifs with the new grandeur of the Beaux-Arts movement.” However, there are many cities in the United States that retained much of their colonial character into the industrial age; New Haven was not unique in that respect. Therefore, one could reasonably expect that Cass Gilbert – with his interest in historic architecture and preserving colonial character– would be expected to apply similar methods of design in other colonial cities. In addition to viewing the New Haven Green as a living testament to the city’s colonial past, Gilbert also found it necessary to reinforce the Green’s role as a civic center as well. As Gilbert told a reporter for a June 5, 1907 article in the New Haven Register newspaper, “public buildings should be located with a view to the convenience of the public and not at the caprice or interests of individuals”, he continues, “a public building on a street of retail stores has been known to ruin the business of the street.” Gilbert felt that commercial and civic functions should have their own distinct places in cities with public buildings concentrated in central locations that are visible and accessible to the general population and not integrated with commercial development. The Report’s authors, in presenting their concerns on traffic, state that, “the congestion of streets must soon be relieved, either by the widening of individual streets or by providing a way for traffic to be deflected.” However, later in the Report the authors present another solution for “avoiding the congestion of traffic”, which the authors view as “inevitable where high buildings are concentrated”. The suggestion was that “a building height limitation not exceeding 100 feet be imposed by law upon the property fronting the Green [which] might [also] be made to apply […] to the proposed new civic center, to the station plaza, and to the proposed new avenue leading from the station to the Green.” While the authors admit that “the question of control over the character of the buildings surrounding the Green is a serious and perplexing one [and that] unreasonable restrictions should not be attempted”, they ultimately decided to recommend the height limitation. 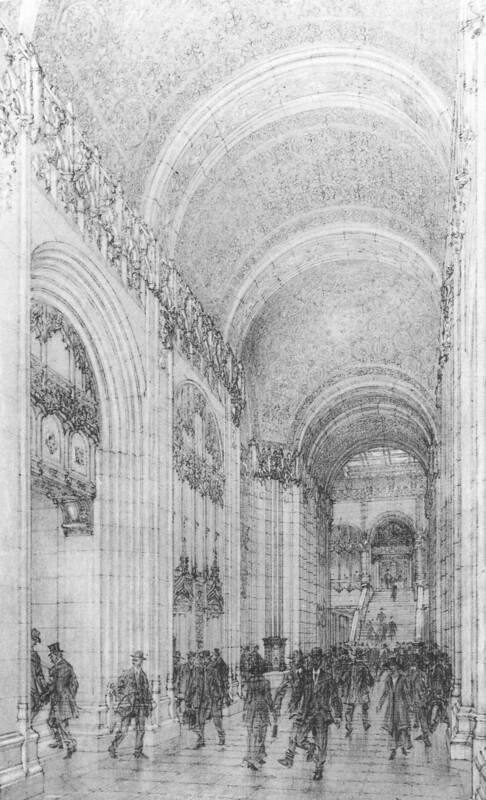 As seen in Gilbert’s initial sketches and final rendered drawings for New Haven’s center (Figs. 16, 17, & 18), an effect like that of Paris was greatly desired. In the drawings, only steeples, copulas and clock towers are visible in the skyline and only public open spaces are articulated at street level, thereby differentiating civic and public functions from the uniform private urban building fabric of commercial development. The final suggestion from New Haven’s City Practical Report considered here that highlights the Beaux-Arts architect’s, particularly Cass Gilbert’s, dilemma is one that concerns public ownership of some of the city’s built and natural resources. The Report’s authors advocate for rail investment, preservation of water reservoirs, and “public control of harbor development”, which, in Douglas Rae’s opinion, “would probably have been very wise”. Along with advocating for stronger private land use regulations and lavish public buildings, the Report’s suggestions about public ownership and management of the city’s resources seem to present a conflict in political ideology for Gilbert, who “was a republican in his party politics”. 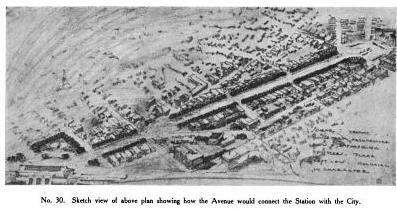 If the Report of the New Haven Civic Improvement Commission is the embodiment of Cass Gilbert’s views on proper city planning, then many of the suggestions in the Report present a clear contrast with much of the architect’s built work around the time period, many of which were tall buildings. 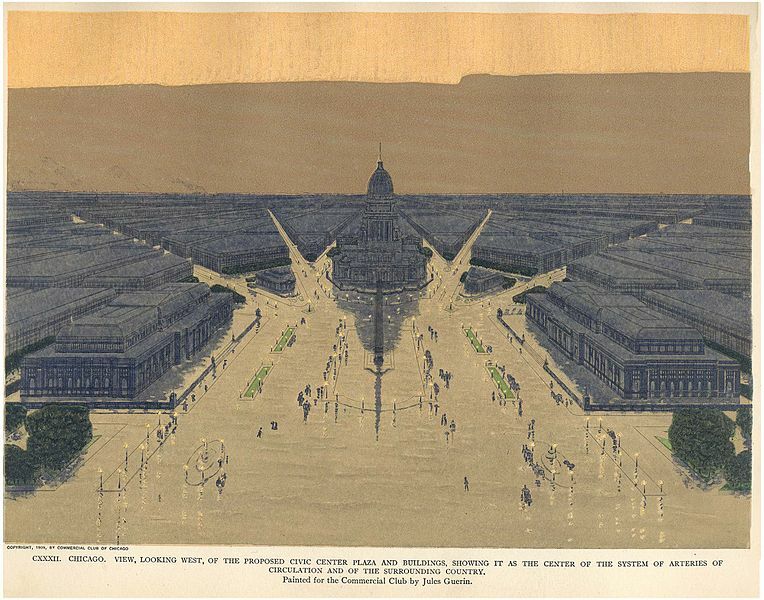 And if Gilbert’s work is representative of the Beaux-Arts architect of the time, which as a national leader in design and planning he would be, then there is a clear conflict between the views of City Beautiful planners and their commissioned work (Figs. 19, 20, 21). If, as the Report suggested, New Haven should prepare for exponential population growth that would lead the city to eventually becoming a metropolis of a million and a half by the end of the 20th Century by looking to the development patterns of cities that are already large, then surely the New Haven plan could learn from some of Gilbert’s own work in larger cities. Interestingly though, Gilbert’s 12-story Spalding Building in Portland – a city with a 1910 population of 207,000 or, in other words, New Haven’s projected population for 1925 – would have violated the height limitation being suggested in the New Haven Report. 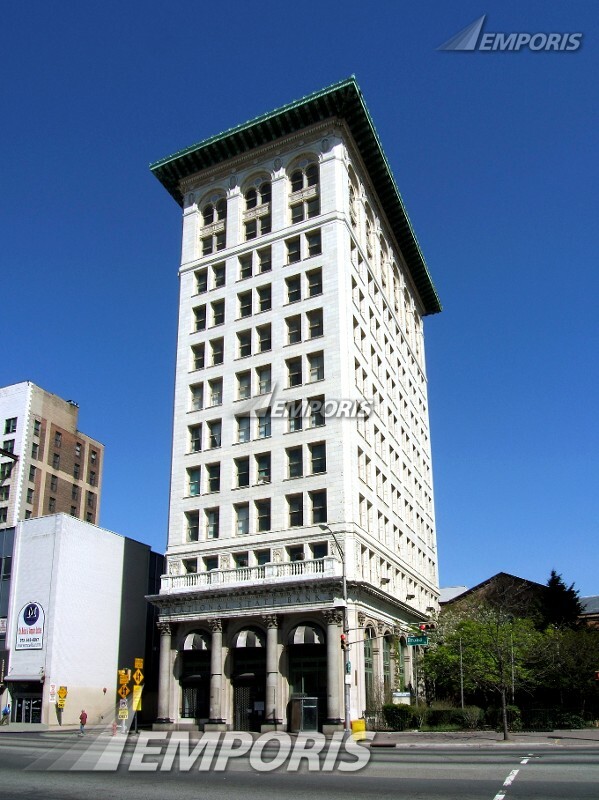 Same with Gilbert’s First National State Bank Building – also 12-stories – located in Newark, which at the time of the building’s construction had a population of about 350,000 people. And finally, Cincinnati’s 495-foot tall Union Central Life Insurance Co. Building doesn’t come anywhere close to meeting the New Haven Report’s 100 foot maximum building height even though New Haven’s future growth was predicted to surpass Cincinnati’s 1910 population of 360,000 in less than 50 years. Clearly, population demands did not influence Gilbert to design tall buildings. 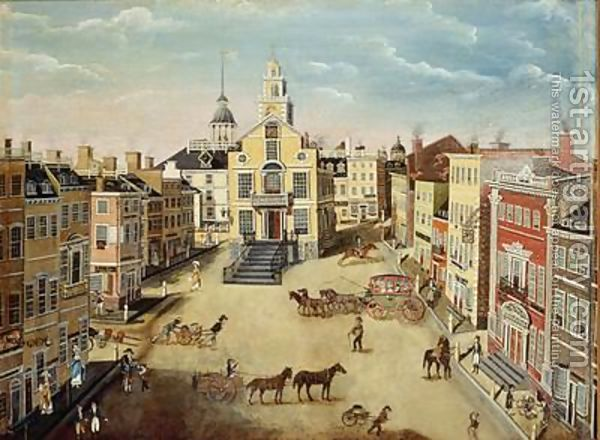 Boston, like New Haven, was a colonial capital that rapidly grew with the onset of industrialism in the United States. Also like New Haven, Boston maintained some of its colonial character into the industrial age. The Old State House in Boston (Fig. 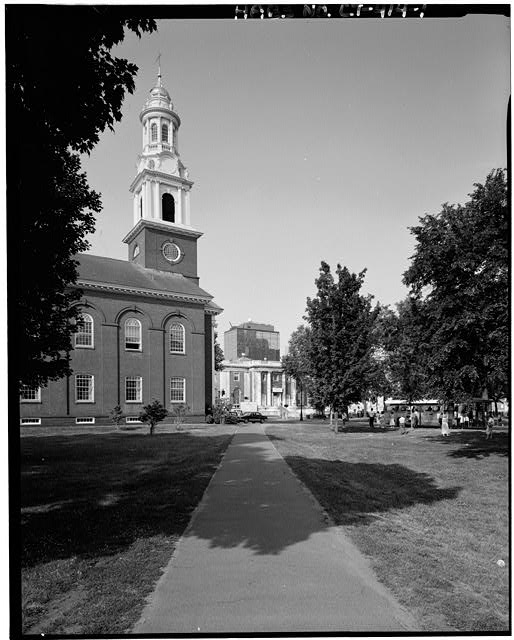 22), for instance, was built a full century before New Haven’s United Church, which Gilbert admired so much and drew from in his design for the New Haven Public Library (Fig. 23). New Haven’s library design stands in stark contrast with Gilbert’s design for the 11-story Brazer Building, which sits next to Boston’s Old State House and violates the historic square’s colonial scale (Figs. 24). A building design that would have perhaps been more consistent with Gilbert’s views is the 13-story Union Trust Company building (Figs. 25 & 26) that, coincidentally, is located in New Haven and faces the Green. Built in 1927, the Union Trust Company building is “Colonial Revivalism to the nth degree.” In many ways, the Union Trust Company building is the embodiment of Gilbert’s views on appropriate design within a colonial context like that of Boston’s Old State House square, yet Gilbert’s own design of the Brazer Building is perhaps more akin to the type of “so-called ‘modern improvements’ and buildings” that Gilbert decried were popping up on the New Haven Green at the same time of the Brazer Building’s design and construction. So while the authors of the New Haven Report state that “a public comfort station must be provided sooner or later, but this may well be placed below the surface, as in Boston,” the same doesn’t apply when it comes to skyscrapers. Gilbert not only saw New Haven’s Green as its historical center, but also as the appropriate future center of its civic life. In securing this future, Gilbert advocated for acquiring land around the Green for future public and civic building sites, in addition to proposing the height limitation, which would have retained the colonial scale of the Green so as to prominently display the civic buildings over commercial endeavors. However, his approach with New Haven’s civic center, which Gilbert thought would become the center of a large metropolis, is vastly different from his approach to New York’s civic square, City Hall Park. 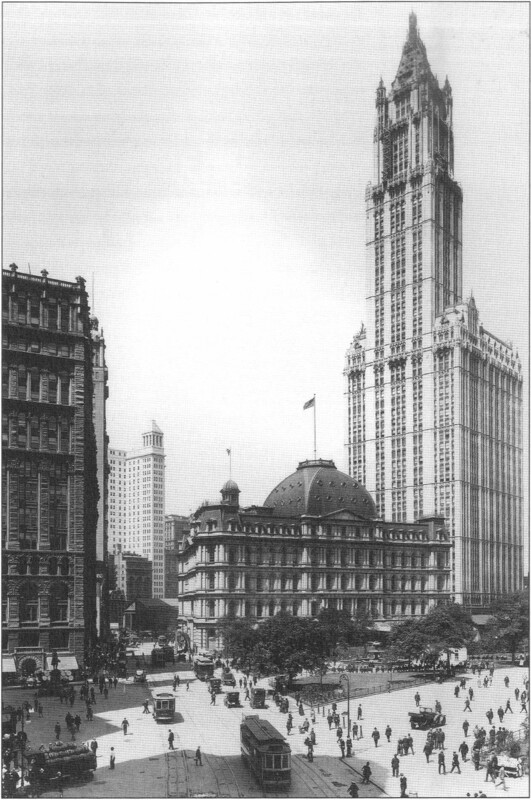 Two tall buildings, the Broadway Chambers Building and the Woolworth Building, which would have violated a 100-foot building height restriction, were designed by Gilbert to face New York City’s historic center and civic square (Figs. 27 & 28). Gilbert did not view the deployment of the skyscraper in cities as a means of accommodating future growth. A full generation before the modern critiques of the skyscraper by people like Frank Lloyd Wright and Le Corbusier, Cass Gilbert expressed his concerns with the propensity for tall buildings to generate traffic congestion; the mitigation of which he saw as an integral duty of municipal governments and city planners. In the early 20th Century, maintaining and improving infrastructure for the convenience of private investment was the primary role for municipal government in New Haven. Similarly, City Beautiful plans attempted to respond to the unplanned industrial growth of the 19th Century by ordering the cores of cities around boulevards and public spaces. This approach was used in Haussmann’s modernization of Paris where he created wide boulevards linking open spaces that provided a framework of valuable building lots to sold, for a profit, to developers. The apartment blocks and department stores that lined the new boulevards were built to a height of around 7 stories – the maximum capacity at a time before the practical elevator and construction technology existed to raise buildings above the vertical walking distance of the population. 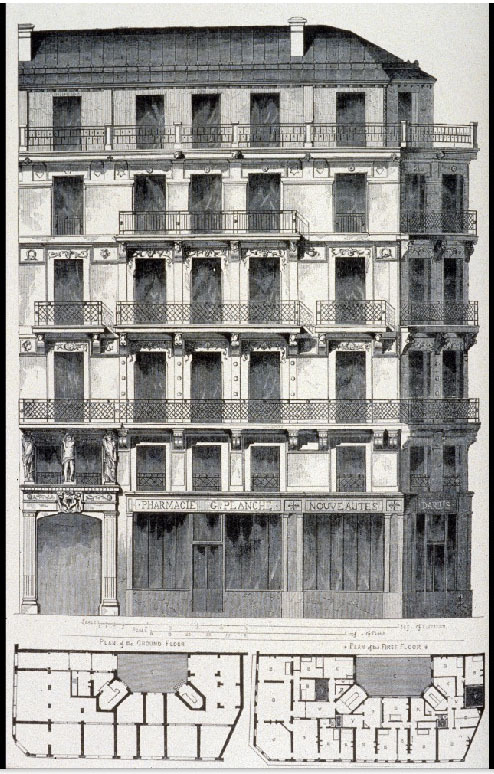 However, by the turn of the 20th Century, advanced elevator technology was readily available and in use throughout the United States, but the City Beautiful architects preferred the resulting urban form of Paris for aesthetic and circulation reasons to the actual model that was used by Haussmann to maximized development. Lastly, Gilbert’s views on the importance of regulating private land-use and encouraging public ownership and management of resources conflict with his Republican Party alignment, which, at the time, favored the protection of individual property rights and exploitative private enterprise. The authors of the Report of the New Haven Civic Improvement Commission acknowledge this conflict by stating that, “whatever views may be held by anyone upon the subject of socialism in its controversial aspects, there is no escaping the fact that the normal course of urban development through which New Haven is passing leads inevitably to an increasing mutual dependence”. It is precisely this kind of rationalization of conflicting ideologies that embodies the Beaux-Arts architect’s conflict in this era. It is a conflict between personal beliefs, which, in the case of the City Beautiful Movement, are informed by the best practices of urban design from around the world and the combination of the reality of limited public sector power and willingness in the United States in the early 20th Century in addition to the reality of practicing architecture, which is a commission-based profession. However, just as Gilbert’s political views are reconciled by the reality of existing and future conditions, so too are the commercial designs of City Beautiful architects reconciled, albeit through compromise. 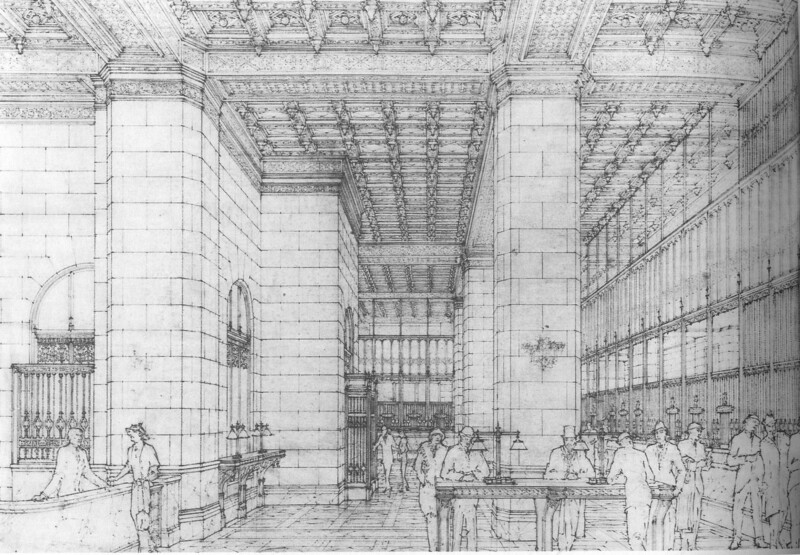 Gilbert’s involvement in the Detroit City Beautiful Plan with his design for the city’s Public Library, perhaps best displays the movement’s need for compromise in order to achieve its goals. “Gilbert’s library design”, described by University of Virginia School of Architecture architectural history professor and scholar Daniel Bluestone, “embodied a Renaissance conception of artistic collaboration [and] the library’s community of artists provided something of a model for ideals of civic unity and coalescence around the standard of elite culture.” Furthermore, his design appealed to “civic monumentality” and achieved the ideal Beaux-Arts form. However, in order to achieve this civic ideal, a compromise was made in the planning of the civic center of which the library is a part. According to Bluestone, “in grouping the library and museum in the center, outside of the downtown, the architects of the civic landscape conceded to commerce not only the skyline but also the central position in the city.” Gilbert felt that civic centers, in order to be most dignified and representative of modern culture should be in the psychological center of the city. However, achieving that in Detroit would have required the purchasing of expensive land and competing with existing tall buildings in the city’s downtown. By compromising with location, the ideal urban form, as understood by the City Beautiful Movement, was achieved. The Woolworth Company Building presents another type of compromise that is perhaps the best example, in a single building, of a Beaux-Arts architect’s ability to reconcile the competing goals of civic duty with the requirement of the commission. As architectural historic Sharon Irish explains, “despite being a private real-estate venture, the Woolworth Company Building became a civic monument due to its height, its ornament, and its location.” Adding to these civic qualities, the building ““offered the public a large lobby with shops and restaurants (Fig. 29) as well as elaborate decoration” throughout the building, but especially in the public areas like the bank (Fig. 30). Irish credits Gilbert’s “talent for using architectural forms to connect disparate activities and people” in a diverse early 20th Century United States and “his monumental public work coexisted easily with his commercial designs, in part because of their large scale and the increasing similarities between the organization of business and government” with his success as a designer. Furthermore, Gilbert’s own views on reconciling his civic mindedness with his skyscraper commissions, as pointed out by architectural historian Gail Fenske, were positive, for he “optimistically believed […] that in masterminding an artistically designed as well as professionally engineered skyscraper, it was possible to have [both] an architecture that evoked the character of a European capital as well as an architecture that served the functional needs of the twentieth-century city.” This is a sentiment that Gilbert himself expressed. In looking back at his career, Gilbert reflected that “the changing skyline of New York is one of the marvels of a marvelous age […] skyscrapers were born of necessities of time and space, under the urge of modern life, and they are expressive of its commercial conditions and the enterprise of epoch.” However, Gilbert does contradict his views on traffic congestion, but compensates with a building that is decidedly civic in its ornament, form and function. 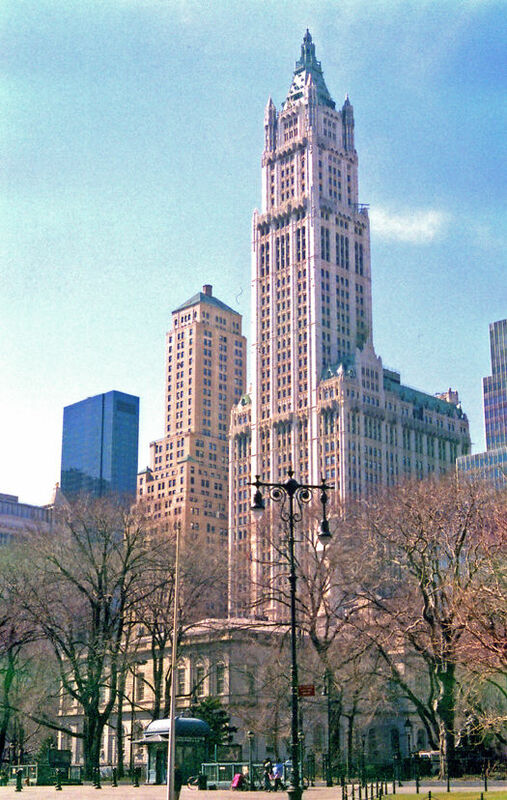 And while Gilbert included ground level public spaces and highly ornamented facades on many of his tall buildings, none do so on the scale of the Woolworth. The Woolworth Company Building is the culmination of Gilbert’s journey, which began with his less successful early east coast projects that were designed from his St. Paul office, to reconcile his views on planning with the requirements of the commission. Just as “the fact that the normal course of urban development” required Gilbert to contradict his republican political views, the “urge of modern life [to express] commercial conditions and the enterprise of epoch” provided the rationalization for Gilbert to compromise, along with other Beaux-Arts architects, his planning views as established in the Report of the New Haven Civic Improvement Commission. As various City Beautiful plans show (Fig. 31, 32, 33 & 34), if given a choice, the Beaux-Arts architect would prefer to develop buildings that contribute to an urban fabric that is proportional to street widths, organized around public spaces and civic buildings, and the embodiment of beauty as well as functionality while reforming land use policy so as to increase public control of growth and design of urban areas. However, since policy changes were a long and difficult battle and development in the early 20th Century was capitalist driven, architects had to make do with the commissions that they were given. Architects reconciled this conflict by developing an architectural language that applied civic qualities to commercial buildings. This language included engaging ornament around the base of the building, the inclusion of interior public spaces that were designed to feel accessible, and forms that promoted high civic aspirations. And while this process came with compromises, they were a necessary part of developing an architectural language that was imbedded in civic ideals and could also be applied to the design of market-oriented commercial buildings.